This Eye Gel Contour by REN reduces the appearance of puffiness and dark circles in order to refresh and brighten the eye area. Under or over makeup, this natural eye cream stimulates the drainage process so as to Arnica and Damask Rose, refreshes the skin around the eyes due to Mucilages from Fig, wild Sorrel reduces puffiness and Ginseng is anti-inflammatory. The eye area looks smoother and firmer. Active 7 Radiant Eye Gel by REN is the jetlaggers' best friend ! This product contains Phenoxyethanol that is a synthetic preservative. Apply REN Active 7 Radiant Eye Gel onto clean eye contour with fingertips out of the corner of one’s eye outwards to stimulate the drainage process. First remove makeup the eye area with No1. Purity Cleansing Balm. Then moisture the skin with Frankincense Revitalising Night Cream. REN’s philosophy of Clean Skincare can be summed up in three words: Performance, Purity, Pleasure. Indeed, REN skincare products are effective with clinically proven results, natural with only 100% plant and mineral derived actives and their textures and fragrances make the world a slightly nicer place to be. 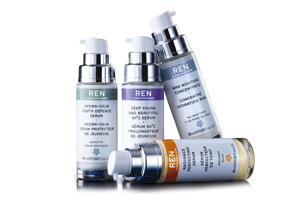 REN skincare products are free from skin-unfriendly chemical ingredients like synthetic fragrance, mineral oil, ,sulfate detergents, synthetic colours, PEG's and parabens. Ecocentric is an organic and natural skin care and cosmetics online store offering the best in made in France premium and efficient natural face care and skin treatment products. Unique and exclusive organic and natural beauty brands to find a natural moisturizing and firming eye cream, an organic anti-wrinkle eye contour treatment, a natural anti dark circles and puffiness eye care product.